Penzey’s makes some bomb spices. 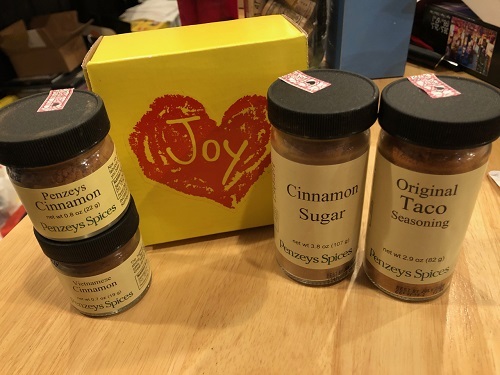 Included in this prize is a Joy of Cinnamon box, which includes a 1/2 cup jar of cinnamon sugar, a 1/4 cup jar of Vietnamese cinnamon, and a 1/4 cup jar of Penzey’s cinnamon blend. Also included is a 1/2 cup jar of taco seasoning, ’cause who doesn’t love tacos?